It is nearly holiday time here in Oman and we are really looking forward to a rest. We have been working flat out to finish the ship in time for launch, but now we are there. We are just putting the finishing touches to the steering system then the Jewel of Muscat will be structurally sound and strong for launch. The scaffolding has come down now from around the boat and it is really stunning. I don’t know how to put into words how I feel about the ship. 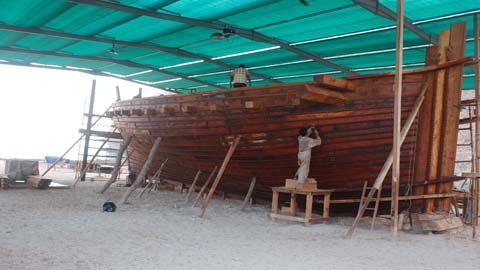 All of us who have worked on her, the Omanis, the Indians we feel very passionately about this beautiful ship. It’s been a joint effort and we have created something truly beautiful. It’s like it’s our baby, our child. Now we are planning the launch of the ship, but that’s proving a lot more difficult than we thought. We are working with engineers to create a track with a constant slope right down into the water. The ship will be supported in a cradle which will run along the track down into the water at low tide. Then when high tide comes she should just float off the cradle. But building the track so that it goes right into the water is very difficult because it needs solid ground to rest on. We think we have a solution of using large concrete blocks, but we have to make sure we get it right. Launching a ship is always like this, it’s a time for big celebrations but it’s also a time for major worries in case the boat gets damaged or she does not float properly. But all that can wait – now it is time for the holidays!